DICE Declares February "Battlefield 4 Player Appreciation Month"
Bonus XP, free shortcut bundles, and a-Battlepack-a-day highlight the community celebration. 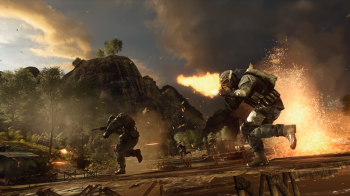 As far as launches go, Battlefield 4 was more Bay of Pigs than D-Day. DICE frantically tried to fix bugs as EA's stock took a dive. But now, as things are on the mend, DICE has decided to celebrate the battle-hardened veterans who have stuck with them until now. First, they asked players for input on future balancing, and now, it's declared February "Battlefield 4 Player Appreciation Month". Starting February 1st, players will begin earning a host of goodies. First, they'll earn a Battlepack every day they log in, which come with camos and XP boosts. Playing on a weekday will earn you a bronze Battlepack, while logging in on the weekends will earn you a silver Battlepack. To earn a gold Battlepack, you'll have to participate in the new global DICE Community Missions, which are special challenges to unlock. In addition to all that, there will be two new shortcut bundles that will be free downloads for players who want to go ahead and get the good stuff. Also, every weekend will be a double XP weekend, with an added bonus for Premium players. It's like pizza and ice cream every day. Anyways, it sounds like a pretty solid deal for players who aren't suffering from chronic instability issues.